One thing is for certain: Japanese directors are in the top of the family drama genre, which they have been perfecting since the beginning of the country’s cinema. And although “Dear Etranger” (the French word for stranger in case you were wondering) is not a masterpiece, it certainly proves the fact. The film won the Special Grand Prix of the Jury Award at the 2017 Montreal World Film Festival. The script is based on Kiyoshi Shigematsu’s 1996 novel “Osanago Warera ni Umare”. Makoto is an assistant manager to a big company and a career man who separates himself from his colleagues by being dedicated to his family, meaning he does not go for drinks with them after work, but instead prefers on returning to his house and spending time with his family. 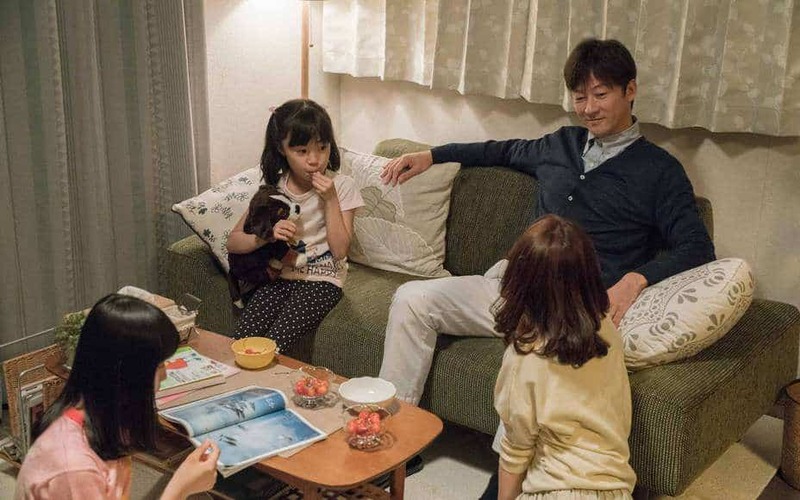 His family situation, however, is quite complicated, since he currently lives with his second wife, Nanae and her two daughters from a previous marriage, Kaoru and Eriko, while his ex-wife, Yuka and his daughter, Saori live with the former’s new husband. When Nanae is pregnant again and Yuka’s husband is diagnosed with a serious illness, the situation becomes even more complicated, with the fact that Makoto is transferred to a warehouse to work adding to his circumstances. Yukiko Mishima directs a family drama that revolves around three axes. The first one focuses on Kaoru, a teenager that feels neglected, particularly after she learns that she is going to have a new sister. As she cannot handle her frustration, as is the case with her parents, she begins to lash out against everyone, with the “fodder” even aiming at her little sister, whom her parents consider too little to handle the truth. This axis aims to show the difficulty of raising a teenager, and particularly a girl, also highlighting the fact that parents should pay equal (and occasionally even more) attention to their children of this age with the younger ones. The second axis revolves around the “peripheral relationships” between Makoto and Yuka and Saori, and between Nanae, Kaoru and her father. This axis aims at showing that, despite any events and situations, families always remain families, and on a secondary level, how the truth and its revealing should be handled very carefully when children are involved. The third axis, and the one that actually encircles all the rest, is centered on Makoto, and particularly the difficulties a father and a professional has to face in the contemporary Japanese society. Mishima seems to focus on the concept of the “man” and the way he should behave towards his family and his work, as everybody expects from him to be the “rock” that they can hold onto, particularly during dire situations. However, Mishima does not glorify the concept, neither the character, as he shows him on the brink of a nervous breakdown, which actually occurs during the strongest scene in the film. On the other hand, his effort seems to be glorified, as Makoto is presented as a man willing to go to extremes to take care of his family, even when they are unreasonable, and even against all odds. Tadanobu Asano embodies the above elements in outstanding fashion, giving another measured but very sincere performance, highlighting the fact that he can be exceptional in any role he is asked to act. The other great performance in the film comes from Shinobu Terajima as Yuka, who, despite the little time she has on screen, manages to steal the show with a monologue revolving another focus of the movie, regret. Sara Minami as Kaoru is quite convincing as the “justified” bad kid, who lashes out in order to get attention, while Raiju Kamata as Saori plays the almost exact opposite, in a smaller role though. Rena Tanaka as Nanae is quite good as the mother who does not know how to handle anything, largely leaning on her husband for all kind of support. The story however, eventually makes a point of showing that Makoto actually wanted a woman like that. Lastly, Kankuro Kudo as Nanae’s ex-husband plays the lowlife quite accurately, with the exception of a sole scene that shows his true colors. Yukiko Mishima implements the usual tactics of the Japanese family drama, including some flashbacks and relatively slow pace, while Ryo Otsuka’s cinematography focuses on accuracy and realism, although some interesting framing is included, particularly during the violent scenes. “Dear Etranger” is a distinct family drama, that uses an “extreme’ story to talk about a number of social aspects, transcending the ones revolving around the family. Fans of the genre and indie films in general are bound to enjoy it.